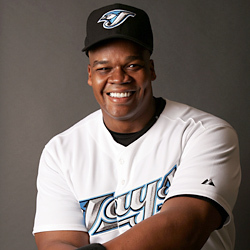 “BIG HURT” Frank Thomas Powers On! On Thursday, June 28, 2007, The “Big Hurt” Frank Thomas (520) hit a three-run home run off Minnesota’s Carlos Sliva an estimated 396-feet into the Metrodome’s left-field stands to join some of his childhood heroes and lifelong role models, such as Ernie Banks, Willie Mays and Hank Aaron as a member of major league baseball’s most exclusive club: The 500 Home Run Club, LLC. Regarded by many as one of the best pure hitters in baseball history, Thomas is the only player in major league history to have seven consecutive seasons of a .300 average, and at least 100 walks, 100 runs, 100 runs batted in, and 20 home runs (from 1991 to 1997). By becoming the 21st member of The 500 Home Run Club, Thomas proved he can still turn on a pitch and send it screaming into the stands. Thomas, who currently has 520 home runs (and counting) has returned to his first team - The Oakland A's - and continues to terrorize opposing pitchers by crushing line drives in bunches. A master at working the count, he now uses this skill to help him guess fastball, and when he guesses right he remains one of the game’s most devastating hitters.